The breakaway from traditional acrylic moulded hot tub design is being led by companies like the southern hemisphere’s Vortex team. Designed by a car designer and an architect, Vortex Spa’s revolutionary new IKON spa is now being sold by spa distributors in the UK, Spain, Canada, Russia, United States, Australia and New Zealand. Vortex Leisure CEO Andrew Pullen decided to create a spa that was ‘undeniably beautiful’ after a Vortex-commissioned survey in 2015 showed ‘lack of visual appeal’ was a key factor preventing people from buying a spa. For a long time, Andrew says, he had suspected that the limited aesthetic appeal of spas was an issue. He spoke with an architect friend, who confirmed it. Andrew recalls: “I asked him, how do architects view spas? 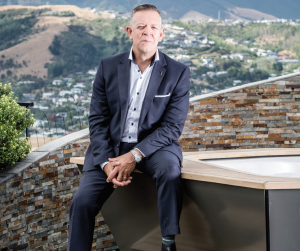 He said we hide them.” Andrew then invited the same friend, Jorgen Anderson, an award-winning New Zealand architect, to be involved in designing a spa that he would happily showcase in one of his architecturally designed builds. The car designer became involved after Andrew spotted him on the television. “It was almost like the universe delivered him,” Andrew recalls. “Within a few days of talking to Jorgen, I was watching the television news and saw Alain Brideson showcasing one of his car designs with the German Chancellor Angela Merkel and Barack Obama at an international trade show.” After a quick look online at Brideson’s impressive achievements as an international product and industrial designer, Andrew was on the phone and had engaged Alain as part of the design team. Working with Vortex’s product designer, the design team of three, set about working to Andrew’s very simple brief to design a spa that you would feature rather than hide. A two-year design process resulted in the IKON. Alain says it was his job to create the core design aesthetic and develop a highly innovative design inside and out. “Personally, it was my goal to design a beautiful spa that was an absolute pleasure to use,” he says. “It is inspired by modern architecture or that special feeling when stepping onto a yacht and ultimate relaxation. Using these key concepts, the design quickly manifested into a clean faceted exterior, grand entrance and simplified interior landscape,” Alain says. Unlike conventional spas, the IKON has been designed with marine-grade architectural materials for the highest possible quality and longevity. For instance, the IKON’s architectural cabinetry is made from aluminium composite cladding, the same material used on the exterior of the Dubai train station, while its maintenance free Flexiteek deck, is like those seen on super yachts. The IKON made its first public appearance in Queenstown New Zealand during the New Zealand Winter Festival in August 2018. Vortex then launched the IKON internationally at Lyon’s Piscine Global in November 2018. Andrew says the reaction has been fantastic. “We were definitely the talk of the show because the IKON moves away from the traditional paradigm. There has been a huge amount of enthusiasm, particularly from architects and high-end pool builders.” The IKON is now available in Russia, UK, Canada, the United States, Spain, NZ and Australia. We are currently having discussions with distributors in Germany and Portugal.